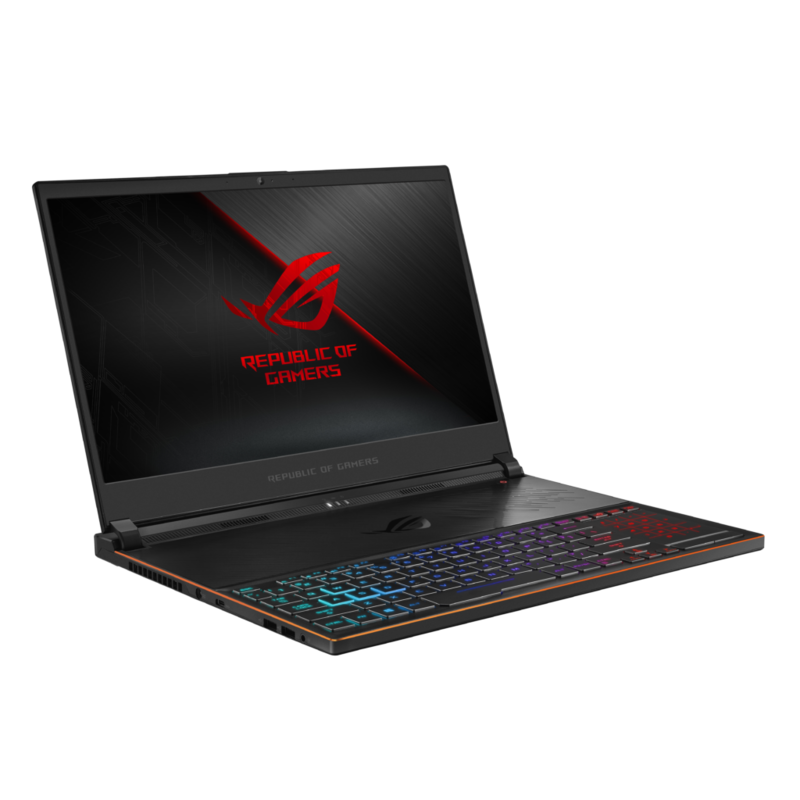 ASUS Republic of Gamers (ROG) today announced the pricing and availability of the ROG Zephyrus S GX531 and ROG Strix GL704 SCAR Edition dubbed as the next generation of gaming laptops with ultra thin form factor. Launched initially at Gamescom 2018 in Cologne, Germany, the Zephyrus S, displayed alongside ROG Strix GL704 SCAR Edition, cements the gaming brand’s status as the top gaming brand in the country, based on GfK data as of June 2018, as it once again shatters its own record for the world’s thinnest gaming laptop and the world’s most compact 17.3-inch gaming laptop. 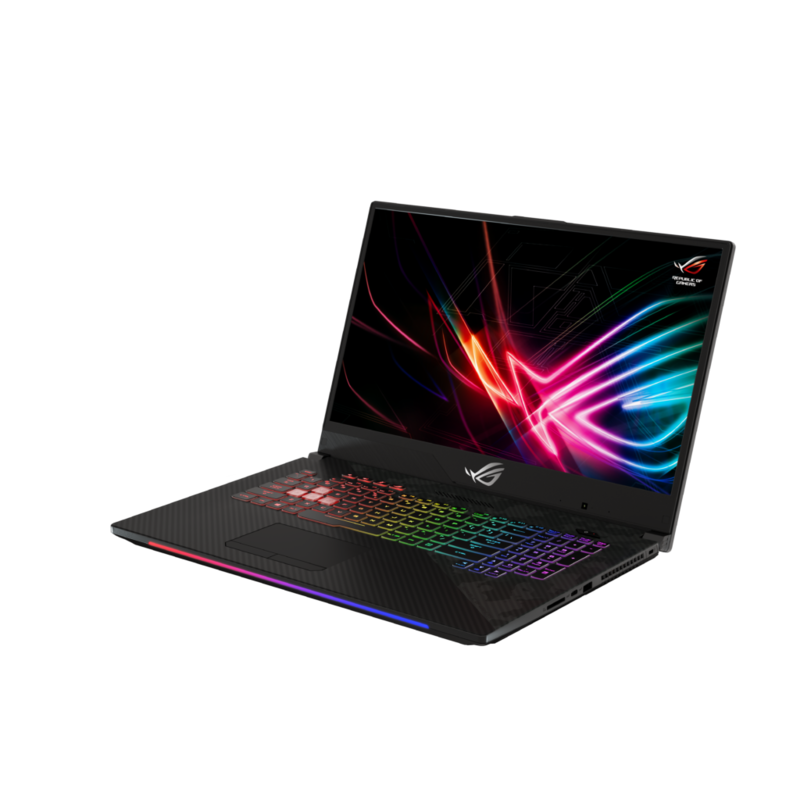 ASUS ROG laptops took the lead in 2017 in gaming notebook activations, leading up to 50.9% and 53% market share in end user purchases during May and June 2018, respectively, based on data by third-party market research agencies. At a mere 14.95mm~15.75mm at its thickest point, the Zephyrus S shaves off 12% of the z-height of its original Zephyrus (GX501) predecessor. However, it packs performance within its ultra-slim profile with the latest Intel® Core™ i7-8750H CPU and an NVIDIA® GeForce® GTX 1060 graphics, making it ideal for work or play. Super-narrow bezels squeeze a 15.6-inch display, with a 144Hz refresh rate and 3ms response time, into a 14.2-inch chassis. The all-metal chassis is strong enough to meet military-grade durability standards without compromising on design, with sleek lines and a premium finish. An advanced cooling system ensures optimal performance of all components, incorporating the proprietary Active Aerodynamic System (AAS) — a design and engineering hallmark of the Zephyrus series. Zephyrus S is capable of heavy workloads in the same way it handles exhaustive gameplay. The latest 8th Generation Intel Core i7-8750H processor offers six cores and 12 threads of parallel processing power that can easily handle demanding work like compiling, rendering, and content creation. The extra cores also provide headroom for multitasking allowing for a mix of gaming with live-streaming, recording, and other tasks. NVIDIA GeForce GTX 1060 boosts performance in apps that support GPU acceleration. More importantly, the discrete graphics chip is capable of pumping out triple-digit frame rates in popular games, allowing for optimal use of the display. Super-narrow bezels allow the 15.6-inch display to be squeezed into a 14.2-inch chassis. In addition, the slimmer bezels create a more immersive gaming experience. Since the original Zephyrus, ASUS has worked closely with panel maker AUO to ensure ROG laptops have the very best displays for gaming. The 120Hz panel on the initial version doubled the refresh rate of conventional displays, while Zephyrus S pushes the refresh rate to 144Hz, and reduces blurring and ghosting by lowering the response time to 3ms. It covers 100% of the sRGB color gamut, ensuring richness of color, and wide viewing angles keep the picture from washing out when viewed in split screen. Cooling the critical components that comprise Zephyrus S is a difficult engineering feat due to the ultrathin design, but it’s imperative to ensure peak performance. The new Zephyrus S acquires the Active Aerodynamic System (AAS) from the original Zephyrus. AAS’ mechanism draws in more cool air in a special vent that opens underneath the chassis of the laptop when the lid is lifted. The AAS intake measures 5mm on Zephyrus S, stretching across the entire back of the body to improve airflow by 22% compared to traditional designs. Additional airflow comes in from through the keyboard, and the keyboard’s forward layout makes more room for additional cooling throughout the system. Although the keyboard-forward layout on Zephyrus S primarily benefits cooling, it also allows for a more comfortable desktop-like resting position. Overstroke technology fires earlier in the key travel for quicker responsiveness, and the longer post-actuation distance maximizes the 1.2mm of travel to improve the overall typing feel. The durable switches are rated for 20 million presses, so they can withstand heavy use, and N-key rollover ensures each press registers precisely regardless of how many keys are mashed at once. The Intel Core i7-8750H CPU in Zephyrus S is backed by fast DDR4 2666MHz memory and NVMe® storage, while 802.11ac Wave 2 Wi-Fi connects to compatible wireless networks at greater-than-gigabit speeds[i]. USB 3.1 Gen 2 Type-C™ (USB-C™) and full-size HDMI 2.0 ports support desktop monitors and big-screen TVs, allowing users to connect dual auxiliary displays. More USB ports are ready for essential gaming peripherals and ubiquitous external storage, and there’s a USB 3.1 Gen 2 Type-A port offering additional bandwidth for compatible devices. Strix GL704 SCAR puts an industry-leading 17.3-inch display — with a 144Hz refresh rate, 3ms response time, and complete sRGB coverage — into a 15.7-inch chassis, delivering immersive visuals while allowing for greater mobility. Strix GL704 SCAR is equipped with powerful components and innovative features including the latest 8th Generation Intel® Core™ i7-8750H and an NVIDIA® GeForce® GTX 1060 GPU with 6GB of video RAM. Strix GL704 SCAR also includes ROG RangeBoost technology, which intelligently utilizes additional antennas to extend Wi-Fi range. The HyperCool Pro cooling system incorporates three heatsinks and two fans, ensuring optimal system performance. The durable camouflage and Kevlar textures adorning the chassis take their design inspiration from first person shooter (FPS) games. In addition to up to six cores and 12 threads in the powerhouse Intel Core i7-8750H and the gaming prowess of the NVIDIA GeForce GTX 1060, Strix GL704 SCAR comes loaded with features that provide a versatile and complete gaming experience. Intel’s latest 802.11ac Wave 2 Wi-Fi uses faster frequencies for link speeds up to 1.73Gbps[ii] with compatible routers, so now the wireless connection can download games and updates as quickly as a wired one. Internal storage is split between a speedy M.2 NVMe® SSD that loads games and applications in the blink of an eye, plus an optional secondary 1TB solid-state hybrid drive (SSHD) for that growing collection of games. At Computex 2018, ROG set a new standard for gaming laptops by framing an ultrafast display panel with super-narrow bezels in the 15.6-inch versions of Strix GL504 SCAR and Hero. Strix GL704 SCAR continues this trend, and is the first 17.3-inch laptop under 400 mm wide, a feat made possible by the super-narrow bezels surrounding the display on three sides. The 7.05mm borders are up to 50% narrower than those found on other 17-inch gaming laptops on the market. Externally, Strix GL704 SCAR is designed with FPS gaming in mind, with contrasting Kevlar and camouflage textures created with an eight-stage IMR process. A hairline finish brushes across the Gun Metal lid, while the copper cooling fins provide flashes of color through the vents. Through AURA Sync, RGB lighting can be customized across seven zones: four for the keyboard, two located within the light bar stretching across the front edge, and the last one within the ROG logo on the lid. The lights can then sync to Aura Sync-enabled peripherals such as the Strix Fusion 700 headset and the Gladius II Origin mouse. The keyboard on Strix GL704 SCAR has a desktop-style layout, with a wider space bar and separated blocks of function keys to make shortcuts easier to execute. The keyboard’s switches are rated for 20 million key presses, and Overstroke technology allows them to fire halfway through the 1.8mm key travel for a faster response than traditional designs that actuate lower in the stroke. These features ensure that the Strix GL704 SCAR keyboard retains a comfortable typing feel for years to come. “Our performance for the last year has been nothing short of outstanding. This is a success that we credit to our commitment to address the needs of our customers, especially in today’s rapidly growing e-sports scene in the country,” continues Su. “Of course, we will not stop there; this year will surely be another challenge to conquer as we aim to push further and reach 60% market share. ROG fans can expect us to continue to deliver innovative and first-in-market products that are befitting of the best—truly the number one gaming brand for those who dare,” Su concluded. The ASUS ROG Strix GL704 SCAR Edition will retail for PHP 114,995 and will be available on October 2018 in all ROG stores and authorized resellers nationwide. 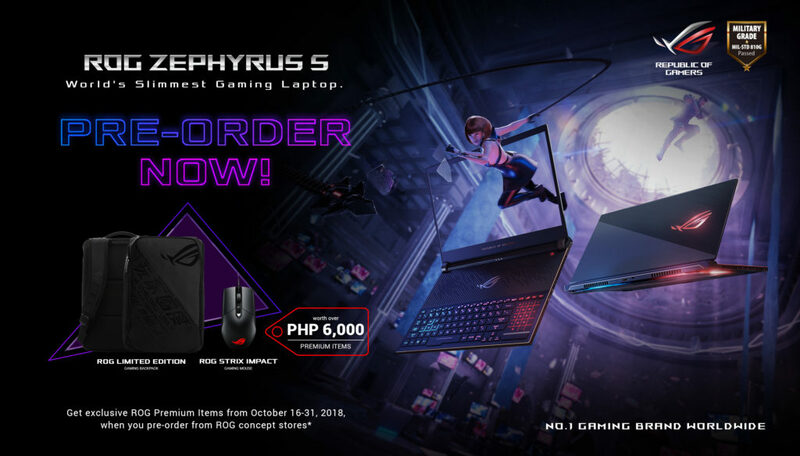 The ASUS ROG Zephyrus S GX531 will retail at PHP 129,995 and is now available for pre-order with exclusive bundles worth over PHP 6,000.